It always amazes me how much God cares about the small, insignificant things in life. It doesn't matter how trifling it may seem to us, God wants to grant us the desires of our heart. For a very long time, I have been asking, hinting and praying for a horse. All of my 14 years, I have loved horses. Don't ask me why, I just do! :) About 4 years ago, we had a horse. She was a paint, about 23, and the brattiest thing you ever set eyes upon. You would get on her, and she would buck, and not listen to your directions. Her name was Miss Bean. We bought her from some friends of ours, who we were trying to bless. (And I think my parents were tired of me begging for a horse!) Well, it didn't take us long to realize that she was arthritic, stubborn, and ate a whole lot! But I was happy... until I became scared to ride her, because she bucked. We had her for about 2 years, until we finally sold her to a gentleman who wanted a child's ranch horse. I was relieved, though I didn't want to admit it. As the years passed, I began to want a horse again. Especially the past year. I prayed, and prayed, but the circumstances didn't seem right. For one thing, they eat about 3-4 flakes of hay a day, and with about 10 flakes to a bale, and hay being $15 a bale... well, you get the idea. It's expensive. Well, one day my family and I were walking on the dirt road that we live on. We walk about 3 times a week. It is a 2-21/2 mile walk, round trip. We had just passed one of our neighbors houses when he walked out, and asked us if we like to ride horses. I was about ready to burst...yes! yes! yes! He offered to let us ride his little Arabian/Quarter horse. She is 18, and stands about 14 hands high. He said she never reared, bucked, and was very gentle. I was so excited! I have ridden her about 4 times since, and I am delighted. It occurred to me that God cares about the little desires of our hearts, no matter how insignificant they may seem. I have been praying, and praying for a horse, and God answered my prayer. I have a horse...that's not mine! :) I am so thankful that I have 2 horses I can ride whenever I want to. God never fails. He always does what is best for us, even though it may not be exactly what we had envisioned. Yeah! I really like horses. I really like your recent post! Are you French? Yes...He never fails. I'll pray that you get a calf. What do you like about them the most? 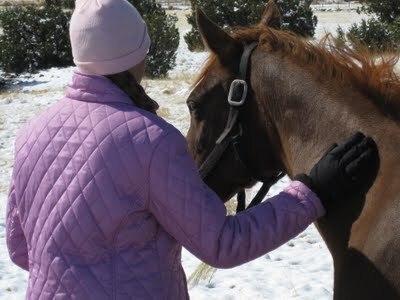 The mare I'm riding is very gentle. So glad... :) You should come out to Az, and ride Alli! (the horse) Have a blessed weekend. I remember the last calf we had, and her sweet shining eyes nestled on either side of her huge forehead. That's what I liked most about her. Those eyes. Cows can be very gentle and kind. Thank you so much for your prayers. It means so much to me! Thank you so much as well, for the comments on my blog. I'm so happy that we met. May the Lord Jesus bless you! I love all farm animals but I should say a horse would be my favorite but goats, sheep, chickens, ducks, you name it are great. I know God is god but I jsut need to learn to wait for my dreams with joy. I actually right now really want chickens, a cow and bees. May be we will get chickens next year but a cow...hmmm we really do not have the land for one. Lovely post, Mikailah! It's so true and wonderful how the Lord cares so much for us, and how He provides for the great and little things! He never fails! I am so blessed to have Christian parents who recongnize the small blessings in live, and are teaching me and my sisters to do the same.